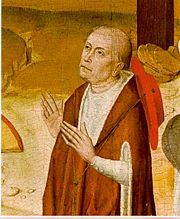 Nicholas of Cusa (born in 1401 in Bernkastel-Kues, Germany – died August 11, 1464 in Todi) was a German cardinal of the Catholic Church, a philosopher, jurist, mathematician, and astronomer. He is also referred to as Nicolaus Cusanus and Nicholas of Kues. Nicholas is best known for his philosophy, encapsulated in two famous phrases: The “coincidence of opposites,” meaning that the many entities and the diversity of the finite world coincide with the oneness of the infinite realm of God; and “of learned ignorance,” the idea that the key to experiencing mystic unity with God through intellectual intuition is an awareness that a complete conceptual understanding of God is impossible and can only be acquired in a limited fashion. His thought exhibited strong elements of mysticism and Platonism within the framework of Christian faith. Nicholas was instrumental in developing the concept of “panentheism,” the idea that God is present in all things and yet transcends all things. His fundamental precept, “coincidentia oppositorum” (the "coincidence of opposites"), was a key concept of the Reformation and replaced the medieval belief that God was a separate entity from the material world. Nicholas of Cusa is seen as one of the transitional thinkers from the Medieval to the modern world. Nicholas of Cusa also conducted the first modern biological experiment, on the growth of plants, and made important contributions to the field of mathematics by developing concepts of the infinitesimal and of relative motion. Nicholas Cusa was born Nikolaus Krebs (latinized as "Cusa") to a merchant family in Kues. His father was a wealthy boatman. According to tradition, Nicholas, apparently useless as an heir to the boat business, was rejected by his father and fled to Count Ulrich of Mandersheid. Count Mandersheid recognized Nicolaus’s unusual intellectual ability and sponsored his studies in the Netherlands and Italy. 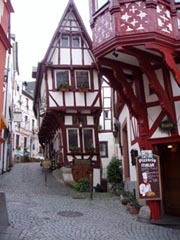 In 1416 he matriculated in the University of Heidelberg. A year later he left for Padua and received his doctorate in canon law from the University of Padua in 1423. He was admitted to the University of Cologne to study divinity in 1425. He began a public career in the Church and made an impression at the Council of Basle in 1432. In 1437, the orthodox minority sent him to support Pope Eugene IV. The Pope gave him a mission to Constantinople, where he enlisted the support of twenty-eight archbishops for the Council of Florence and the pope. In 1438 he was made a papal legate to support the cause of Eugene IV, a commission he carried out so energetically that Aeneas Sylvius called him “Hercules of the Eugenians.” Eugene IV nominated him cardinal; Nicholas declined but was made a cardinal by Pope Nicholas in 1448 or 1449, and was named Bishop of Brixen in 1450. His work as bishop was opposed by Duke Sigismund of Austria, who imprisoned Nicholas in 1460. Pope Pius II excommunicated Sigismund and laid an interdict on his lands as punishment. Nicholas of Cusa was never able to return to his bishopric, however; Sigmund's capitulation in 1464 came a few days after Nicholas's death at Todi in Umbria. Upon his death, his body was interred in the church of San Pietro in Vincoli in Rome, but was later lost. In accordance with his wishes, his heart is within the chapel altar at the Cusanusstift in Kues, a home for the aged which Nicholas had founded and to which he bequeathed his entire estate. Today the Cusanusstift continues to serve the purpose for which it was founded, and contains a library which houses many of his manuscripts. The main ideas in Nicholas’ philosophy can be encapsulated in his two well-known phrases: The “coincidence of opposites,” meaning that the many entities and the diversity of the finite world coincide with the oneness of the infinite realm of God; and “of learned ignorance,” the idea that the key to experiencing mystic unity with God through intellectual intuition is an awareness that a complete conceptual understanding of God is impossible and can only be acquired in a limited fashion. The "coincidence of opposites" is first an ontological principle. It is the idea that all kinds of multiplicity in the finite world become one in the infinite realm of God. For example, if the number of sides of a polygon are increased from a square to a pentagon, to a hexagon, and so on, the polygon will become closer to a circle. If the number of sides are extended to infinite, the polygon coincides with a circle. Take another example: The center of a circle and its circumference are opposites, but if the radius of the circle is made infinitely small, the center and the circumference coincide. A curve and a straight line are opposites, but if the radius of a circle is made infinitely long, its curved circumference coincides with a straight line. Through these examples, Nicholas tried to explain the idea that multiplicity and the many of this finite world are one in the infinite world of God. To put the same idea in a different way, multiplicity and the many in this world are derived from the original oneness of God. This means that the world is enveloped in God, meaning that the finite is potentially in the infinite; and the infinite is in the finite. They are within each other. Every part of the world reflects God, and the totality of the world and numerous individuals exist in harmony. A human being reflects the cosmos through cognition which is divided into three stages: Senses; conceptual understanding; and intellectual intuition, which is mystical unity with God. The individual is thus a microcosm filled with creativity and freedom, and the universe is a macrocosm. Diverse individual beings exist in harmony and unity. The physical senses are a type of cognitive faculty, which reveals an object of knowledge through direct contact. Conceptual understanding is another cognitive faculty, which discovers what the object of knowledge is through the cognitive processes of discerning, comparing, and enumerating. It operates based upon the principle of non-contradiction. The world is presented in multiplicity and diversity. God is, however, one and surpasses or transcends all contradictions. In the infinite realm of God, diversity and multiplicity are one. Accordingly, conceptual understanding cannot reveal who God is and what God is like. Human beings cannot in principle know God through conceptual understanding. The path to God can open up only when we become aware of absolute limits, or the impossibility of knowing God through conceptual understanding. This awareness was what Nicholas meant by “learned ignorance.” By placing absolute limits on our conceptual understanding, Nicholas tried to open the mystical path of intellectual intuition, the only way of knowing God. Since the principle of the coincidence of opposites is operative in the infinite realm of God, human beings are asked to abandon the path of conceptual knowledge and use a cognitive faculty, intellectual intuition. The traditions of negative theology and mysticism are apparent in Nicholas’ thought. While Nicholas limited man’s cognitive path to God, he did not fall into skepticism and relativism because of his Platonist conviction of the eternal existence of truth, justice, goodness, and other cardinal values. In his thought, like that of other Platonists, these values have priority, both in cognition and existence, to the phenomenal world we live in. These cardinal values were not born from the world but were presupposed. God is in all things as their center, and at the same time God transcends all things. Martin Luther later used similar words when he said that God is nearer to everything than anything is to itself. This view of God and the world, expounded by Nicholas of Cusa and Martin Luther, was the modern thought of the Renaissance, replacing the common medieval concept that God is in heaven. These were radical ideas for the Roman Catholic Church. Almost one hundred and fifty years later, during the Counter-Reformation, Giordano Bruno (1548-1600) was declared a heretic and executed for promoting the concept of emanation. Nicholas of Cusa was known for his deeply mystical writings about Christianity, particularly about the nature of the Trinity. Many believe he was influenced by the work of Thomas à Kempis. Most of his mystical ideas can be found in his essays, "De Docta Ignorantia" ("Of Learned Ignorance") and "De Visione Dei" ("Vision of God"). The early Christian Church Fathers adopted the theories of Neoplatonism as a foundation for Christian theology. St. Augustine studied the works of Plotinus, who is considered the father of Neo-Platonism. In The Confessions, St. Augustine wrote that Christian concepts of God and the world were completely consistent with the thought of Plotinus. Augustine identified the ideas of Plotinus with those of Plato; the theory of Plotinus, however, contained pantheistic elements which could not easily be reconciled with medieval Christian views of the world. Plotinus asserted emanation was "ex deo" ("out of God"). The Christian explanation of the creation was "ex nihilo" ("out of nothing") which means that God created the cosmos and all things. The problem concerned what type of material God used to create all things. If this material was an existence before creation, it became a dualism, and the monism that all things were created by one God would be disproven. The concept of "ex nihilo" ("out of nothing") held two significances: the absoluteness of God’s ability to create, namely the almighty power of God; and the absolute distinction of God from the all things. God is the Creator whose essential qualities are different from those of the whole creation. The whole creation cannot be described as God’s double, or alter ego. God must be an absolute other from the whole creation. Therefore, the view that the world was God amounted to “pantheism,” which was unacceptable thinking for Christianity. Later theories of Christianity openly exhibited this tendency towards “pantheism.” One notable Christian thinker was Scotus Eriugena, whose doctrine was regarded as heresy, because his creation theory resembled the “pantheism” of Plotinus. Thomas Aquinas confronted “pantheism” throughout his career. Some scholars, however, thought that even the theory of Thomas Aquinas had an aspect of “pantheism.” From the current of thought initiated by Thomas Aquinas in the Dominican order there emerged several “pantheistic” thinkers, such as Meister Eckhart and Giordano Bruno. Nicholas of Cusa was influenced during his youth by the works of Meister Eckhart. "Panentheism" resembles pantheism and the two are sometimes confused. Panentheism implies that God is not “out there,” a separate entity from the universe. In Greek, “pan” means “everything"; “en” means “in"; “theo” means “God.” Panentheism means that God is “right here.” Pantheism, without the syllable “en,” identifies the cosmos, or all things, with God. Everything is God in pantheism. Pantheism asserts God is immanent, not transcendent. Panentheism asserts not only transcendence but also immanence. God is beyond all things and present everywhere. Panentheism is unfamiliar to orthodox Christianity, but it is rooted in the Christian tradition. The Bible depicts a “panentheistic” God in Exodus, the Psalms, the Gospel of John, and the Letters of Paul. Nicholas of Cusa inherited Anselm of Canterbury’s view of God. Nicholas of Cusa regarded Anselm’s famous series of discussions, which started with God as “aliquid quo nihil maius cogitari potest" ("something about which nothing greater can be thought") as panentheism. Nicholas is also credited with a number of contributions in the fields of science, mathematics, medicine, and astronomy. Predating Copernicus by half a century, Nicholas suggested that the earth was a nearly spherical shape which revolved around the Sun, and that each star is itself a distant sun. He was not, however, describing a scientifically verifiable theory of the universe; his beliefs (which proved uncannily accurate) were based almost entirely on his own personal speculations and numerological calculations. In the field of mathematics he developed the concepts of the infinitesimal and of relative motion. He was the first to use concave lenses to correct myopia, and conducted the first modern formal biology experiment, concluding that plants absorb nourishment from the air and proving that air has weight. In 1433, he proposed a method to elect Holy Roman Emperors which, while it was not adopted by the Church, was essentially the same method known today as the Borda count, which is used in many academic institutions, competitions, and even some political jurisdictions, in original form and a number of variations. His proposal preceded Borda's work by over three centuries. In 1451 Nicholas of Cusa began construction of the Cusanusstift, a home for the aged, housing thirty-three elderly men from all levels of society, representing the thirty-three years of Christ's life. In his will Nicholas of Cusa left his entire estate to this institution. It has remained in operation until today, and houses Nicholas of Cusa's own library and collection of manuscripts, including some in his own handwriting. In his 1927 book, Individual and Cosmos in the Philosophy of the Renaissance, Ernst Cassirer declared Nicholas of Cusa to be “the first modern thinker.” This book stimulated scholars to scrutinize the theories of Nicholas of Cusa in an effort to find ideological and political solutions that could contribute to world peace. Nicholas of Cusa himself struggled to resolve conflicts among different cultural views of the Church and society. In 2001 celebrations of Nicholas of Cusa’s 600th birthday were held in several places, particularly at his birthplace in Germany. The international celebrations recognized his contributions to theology, philosophy, and science and his practical accomplishments in the areas of religious reform, international politics, and voluntary social services. Bellitto, Christopher M.; Izbicki, Thomas M.; Christianson, Gerald, eds. 2004. Introducing Nicholas of Cusa: A Guide to a Renaissance Man. Paulist Press. Bett, Henry. 1932. Nicholas of Cusa (Great medieval churchmen). Methuen and Co., Ltd.
Latourette, Kenneth. 1975. A History of Christianity, Volume 1: Beginnings to 1500. HarperSanFrancisco, revised edition. Nicholas of Cusa. 1998. The Vision of God. Book Tree. Nicholas of Cusa; Sigmund, Paul E.; Guess, Raymond (series ed); Skinner, Quentin (series ed.). 1996. Nicholas of Cusa: The Catholic Concordance (Cambridge Texts in the History of Political Thought). Cambridge University Press, New Ed edition. Sigmund, Paul E. 1963. Nicholas of Cusa and Medieval Political Thought (Harvard political studies). Harvard University Press. MacTutor biography, focusing on mathematical achievements. Catholic Encyclopedia article on Nicholas of Cusa. Translations of numerous philosophical and theological treatises by Jasper Hopkins. Website of the St. Nikolaus-Hospital/Cusanusstift (in German). History of "Nicholas of Cusa"